OptinMonster can work with any website. The best lead generation tool works on WordPress too! This guide will show you how you can integrate the power of OptinMonster into your WordPress site. I don’t see the option to install the OptinMonster API plugin on my WordPress.com site, why? Can I manually place my inline type campaigns? Do I need to use both the WordPress Plugin and the Display Rules? Can I use the Display Rules and the Output Setting’s Advanced Settings together? First, check out our guide on creating and publishing your first campaign if you haven’t created a campaign yet. Next, install and activate the OptinMonster API plugin. 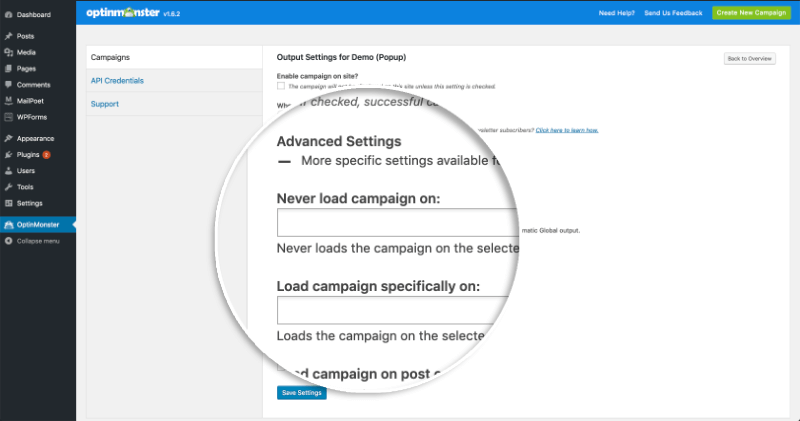 Navigate to the WordPress Admin > OptinMonster > Campaigns tab view and select the Refresh Campaigns button to sync the campaigns from your OptinMonster account with the OptinMonster API plugin. IMPORTANT: Anytime you add or delete a campaign in your OptinMonster account be sure to select the Refresh Campaigns button to sync your list of optins. Next, select the Go Live link below the title of the specific campaign you wish to enable on your site. The status of your campaign will be displayed to the right of the campaign title. If you stop here, your campaign’s embed code will be output throughout your entire site. You can then control where each campaign has permission to load using the Display Rules in the campaign builder. We recommend skipping this step altogether for most users. NOTE: The Output Settings includes optional advanced page level targeting options. You can use these to more precisely control where the embed code for your campaign is placed throughout the site. Be aware that it is not necessary to use these more advanced options since most page level targeting can be achieved using the Display Rules options in the Builder. From the WordPress Admin > OptinMonster > Campaigns tab view you’ll see the Edit Output Settings link below the title of each campaign. This will open the Output Settings screen. Within the Advanced Settings section you can configure more specific page targeting rules to control where the embed code is added through your site. When finished, save your updates. You’re all done! You can now navigate to the front-end of your WordPress site and test your beautiful new campaign! A: When creating your campaign you will want to use the domain of the site where you want your campaign to appear. Campaigns will only show on the domains they are assigned to. You can see more about this in our site settings guide. Q: I don’t see the option to install the OptinMonster API plugin on my WordPress.com site, why? A: Unfortunately it’s not possible to use OptinMonster on WordPress.com sites at this time. All OptinMonster documentation for WordPress is for websites using the self-hosted version of WordPress. Q: Can I manually place my inline type campaigns? Q: Do I need to use both the WordPress Plugin and the Display Rules? Can I use the Display Rules and the Output Setting’s Advanced Settings together? A: Yes, these can be used in conjunction. Learn how our WordPress Plugin and Display Rules work together. Output Settings — The Output Settings control where the embed code for an individual campaign is placed throughout your site. If the embed code is not present on a specific page the campaign cannot load regardless of the Display Rules configured in the campaign builder. Display Rules Configuration — The Display Rules configured in the campaign builder control where the campaign has permission to appear to visitors. The Display Rules only come into effect if the specific page contains the embed code for your campaign. We recommend you not configure any Advanced Output Settings options and instead use the Display Rules to target your campaigns wherever possible.